I really do hate when I have to miss work to b/c I'm really sick and not just gallivanting. I hate even more waking up and feeling like death. After spending Saturday and Sunday between Javits and the Showroom, when I woke on Monday (a day that so many good people rightly have off even if they are employed) I felt like all sorts of yucks and it took every fiber of my being to shower and get dressed at get myself down to the showroom only for my boss to say wow you look like death, hand me a piece of paper with a 24 hour clinic address on it, and send me out the door. Beth Isreal. I can't say that it will be my primary care physician. The nurse that checked me in seriously sounded like the godfather. I didn't think anyone could talk like that in real life... had I been a lil more alive I would have truly appreciated it. After I received two prescriptions, my sad body tried to make its way to a pharmacy to fulfill them. I nearly started to cry when a rite aid told me that there wasn't a single rite aid in Manhattan that carried the crazy inhaler medicine, and then the duane reade told me I had to walk two more blocks to another DR. By the time I made it back to the strangers apartment, I just wanted to sleep. Even when my mom and dad came to see if I wanted them to drive me home, I couldn't bring myself to make the trip. Sad Panda. On a related note, cough medicine with codeine does not make me drowsy, it makes me have weird dreams that make me afraid to go to sleep. I'll stick with NyQuil, thank you very much. My nephews want to take the train today... so they are coming to meet me at my office before joining me on my way back. On my way into the office I have already spotted at least 5 "toys" that are not toys, that are really going to just serve as teases to three little boys... I honestly have yet to figure out how to explain to a 5 year old that yes, it looks like a toy, but its actually work. And I have yet to figure out for myself why we have plastic batman tyke bikes behind glass. The rhinestone studded superman shirt I understand, the back pack and lunch box? Not as clear on. I'm hoping the Gotham city walls when you walk in, and maybe the daily planet entrance on the 7th floor will be cool enough... b/c I'd hate for them to be disappointed given the fact that I've told them that I work with Batman and Superman every day. Oh! Did I tell you that the day I did work at the convention, they left me all alone in Javits as the resident "expert" on all the products?! For those Grey's fans out there, I swear if they kill off Izzy Stevens I am going to be so pissed. I'm slightly allergic to the apartment (how can you tell Tiffany? You've been on your death bed?) well I'll tell you, Friend. The sporadic heater is literally sucking away all the moisture from my skin... where I may have been 90% water before, now I think I'm about 77.8% at this point and fading fast. 8 Words: Oatmeal at Jamba Juice: Steel Cut Oat Wonderment. 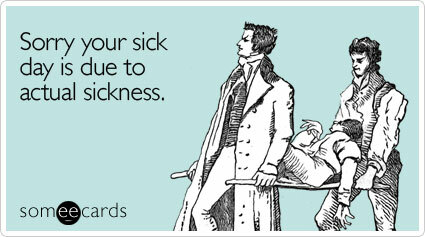 If I could send that "your cough is freakin' disgusting" card to myself, I would. The one girl upstairs has taken to calling me at least once a day... just to see what I'll say. I know I should be flattered that she thinks I'm funny finally, but its very intimidating b/c five minutes later when I go upstairs... my boss is like heh, I heard what you said heh. Repeating any of my babblings to my boss is basically a nightmare. I don't even remember half the stuff that spews out uncontrollably. I cannot, and should not, be quoted. PS Eva CCD does not infact stand for Central City Dump. It is also not Catholic Christian Doctrine (though it is commonly referred to as such. The abbreviation actually stands for Confraternity of Christian Doctrine.